Hi there! My name is Lauren Beglin, and I’m a senior environmental science major at Fordham. Over my time at Fordham, I’ve discovered some amazing groups dedicated to making Fordham a more sustainable place. These groups include the United Student Government Sustainability Committee and Dining Committee, the Residence Hall Association, clubs such as St. Rose’s Garden and Students for Environmental Awareness and Justice (SEAJ), the Social Innovation Collaboratory, and even Fordham’s very own Facilities. I’ve learned a lot about existing and emerging sustainable infrastructure at Fordham from the amazingly dedicated people in these organizations, and I think it’s important to celebrate and participate in existing initiatives to encourage continued progress. In this blog post, I hope to share some ways these organizations have made it possible for students to live more sustainably, and detail some ongoing projects and ways you can get involved. The Sustainability Committee was responsible for the introduction of plastic bag recycling containers in all residence halls, battery recycling containers in all academic buildings, and biodegradable plastic bags at POD. More recently, Sustainability Committee has created the Green Ram, a monthly e-newsletter aimed at educating Fordham students about sustainable practices, and the Sustainable Product of the Month Sale, which gives Fordham students the opportunity to conveniently purchase quality, low-cost sustainable products such as metal straws.Sustainability Committee often works closely with SEAJ to host educational and fundraising programs. Along with the Sustainability Committee, SEAJ is instrumental in the planning and execution of Sustainability Week every October, Earth Week every April, and the twice-semesterly Fordham Flea, a pop-up thrift shop whose proceeds benefit Bronx-based environmental education programs, such as the Bronx is Blooming and the Green Bronx Machine. Dedicated to engaging with students issues on of environmental consciousness and justice on scales ranging from Fordham to the Bronx to the world, SEAJ hosts weekly meetings to discuss emerging topics in the fields of the environment, climate change, and sustainability. The Residence Hall Association has also been working to make it easier for residents to access information about sustainability. In collaboration with the Sustainability Committee, the Residence Hall Association created the new Eco-Rep position in all dorms on the Rose Hill campus. 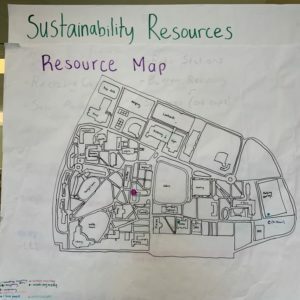 While the program is in its pilot year, Eco-Reps have already begun working with their dorm’s resistant assistants, directors, and Residence Hall Association boards to not only host programs explicitly devoted to sustainability topics, but have also introduced sustainability to programming as a whole. Topics covered by Eco-Reps during their programs include waste reduction, energy saving, fast fashion, and meatless meals. 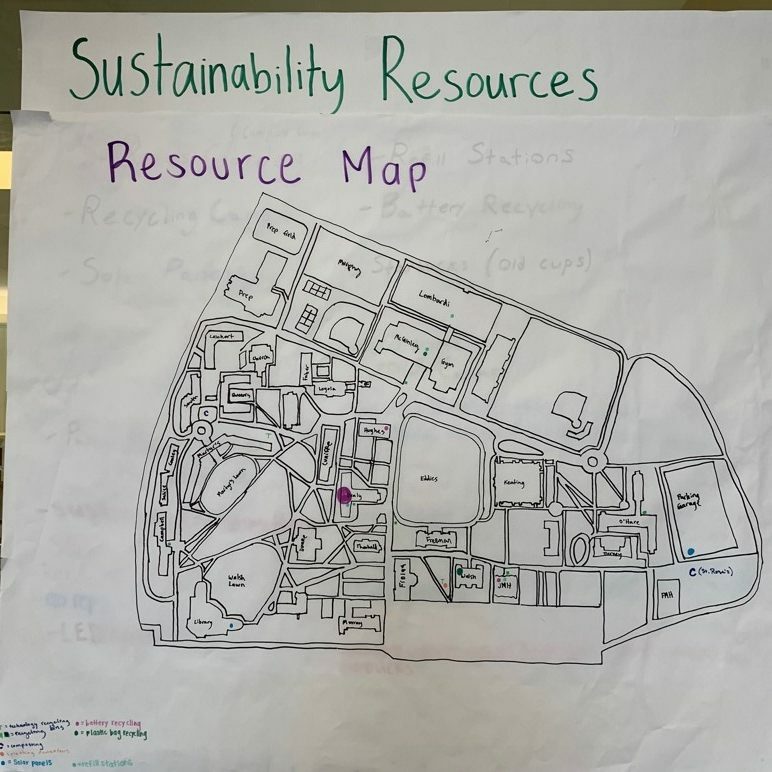 Eco-Reps have also helped other programs adopt a “Bring Your Own” model, in which students big reuseable eatery to events with food to reduce the use of single-use plastics. Eco-Reps also hope to create a composting program in the Walsh, Campbell, and Salice-Conley residence halls. Such an endeavor would not be possible without the help and support of St. Rose’s Garden, Fordham’s gardening organization complete with an on-campus garden. Conveniently located in a University-owned plot to the right of the Ram Van office, St. Rose’s Garden offers students the chance to compost 24/7. Students can bring their compost to the Garden’s three composting piles at any time. While the Garden grows its own fruits and vegetables, it also sponsors a community-supported agriculture program every semester, including the summer, in which students invest in a local farm and receive weekly deliveries of organic, locally-grown fresh fruits and vegetables, ultimately at prices far below retail cost. Another United Student Government Committee is also dedicated to making Fordham more sustainable. The Dining Committee has a sub-committee dedicated to Sustainable Dining Initiatives, and this year they have produced dramatic change in Fordham’s dining policies. Reusable To-Go containers are available for sale in the cafeteria and can be purchased with DCB. They can be used at any dining location on campus, and dirty containers can be turned in at the cafeteria for a new clean one. Reusable mugs and bags are also for sale at POD, and a variety of reusable beverage containers can also be purchased at the bookstore. Reusable beverage containers can be used at any non-service location at Fordham. Best of all, any time you use a reusable item at any dining location at Fordham, you get a ten cent discount! Dining Committee has also worked hard to expand the availability of vegetarian and vegan options on campus. Working both with and alongside these organizations is the Social Innovation Collaboratory, a network of members of the Fordham University community dedicated to the promotion of social innovation to achieve social justice and sustainability. The Social Innovation Collaboratory sponsors a variety of practicums aimed at making Fordham and the world more sustainable and include the Sustainable Food Practicum, the Food Impact Investing Practicum, the Fashion Sustainability Practicum, Net Impact, and the Climate Impact Initiative. Students in each of these practicums work with both the university and outside organizations to tackle environmental issues that are important to them. I hope this post has shown you that there is a large, interrelated network of dedicated students, faculty, staff, administrators, and alumni at Fordham who are trying to make the university more sustainable. 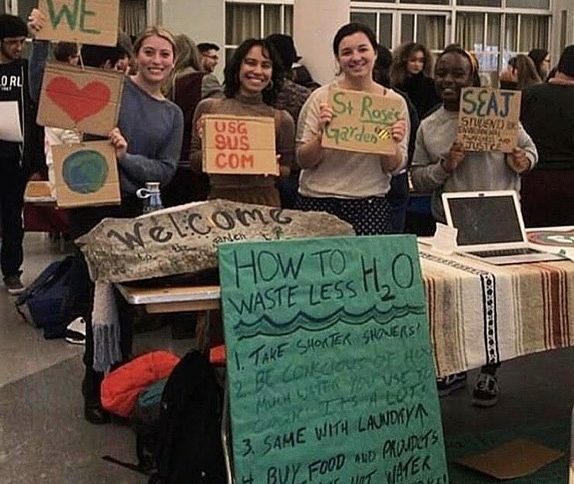 The hard-working activists in these groups have produced tangible change in Fordham’s policies and the best way to show your support for that change is to actively participate in it, whether it’s saying no to a plastic straw or bag, recycling in your dorm or at home and composting at the Garden, purchasing a reusable container at the cafeteria, applying to be an Eco-Rep, joining the Sustainability Committee, or exploring the Social Innovation Collaboratory’s practicums and finding one that speaks to you. Participation in existing programs shows the University that students care about and are engaged in this type of progress, and encourages them to support new initiatives. If learning more or getting involved in any of these organizations interests you, please email me at lbeglin@fordham.edu, or reach out to the organization directly using the emails I’ve provided below. Thanks for reading! Want to get involved? Reach out!